Why did you decide to call it AMUSE HOUSE? I curiously questioned Mr. Tushar Kapoor, Director of the newly opened European Bistro in Ansal Plaza. No doubt, he had done his homework very well. Handpicked delicacies, perfection in presentation, authentic flavors, lip-smacking recipes, exclusive gastronomic delights and reinvention of illustrious dishes are some of the attributes that he has worked on intensely. I am glad that he and his team know it well that there is no other way but good food and only good food that can win the heart of food lovers of Delhi. It is said easy but hard to be done. 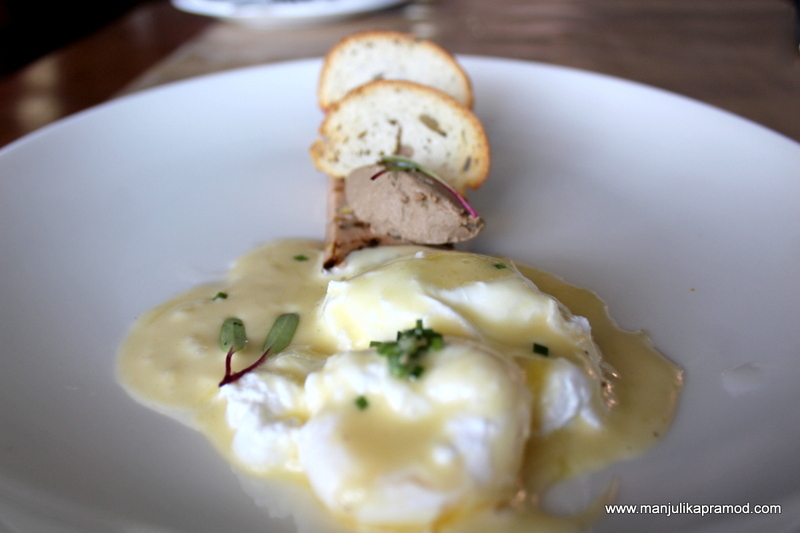 I must say, AMUSE HOUSE, the latest European bistro which has come up in Ansal Plaza a few days ago has got it all. Inspired by the Mediterranean region, in all blue ambiance, it promises big. I was impressed with the food and every detail that came with it and I really want the owners to keep the amusement flowing for long. When I saw these drinks, I was assured that amusement flows here in many forms. I was part of the pre-media tasting session and here is my version. I would suggest you to go through the pictures first and then come back and read further. By the time, you will be done with all, I bet you will both, curious and hungry . Amuse House is a cool new restaurant which is set in a very pleasing blue tone. With stylish candle stands above every table and soft decorations to pep up the ambiance, it appeals to be a simple, sombre and stylish place to catch up with family and friends. This newest bistro is divided into two floors, an event-oriented experiential area on the ground floor which will be curated to hold gigs and flea markets. The first floor of the property hosts an avant-garde Al Fresco dining along with a quaint enclosed dining space. If you have those special memories of Al Fresco dining from the European streets, you will love to visit this place and indulge in delicacies from across countries bordering the Mediterranean Sea. 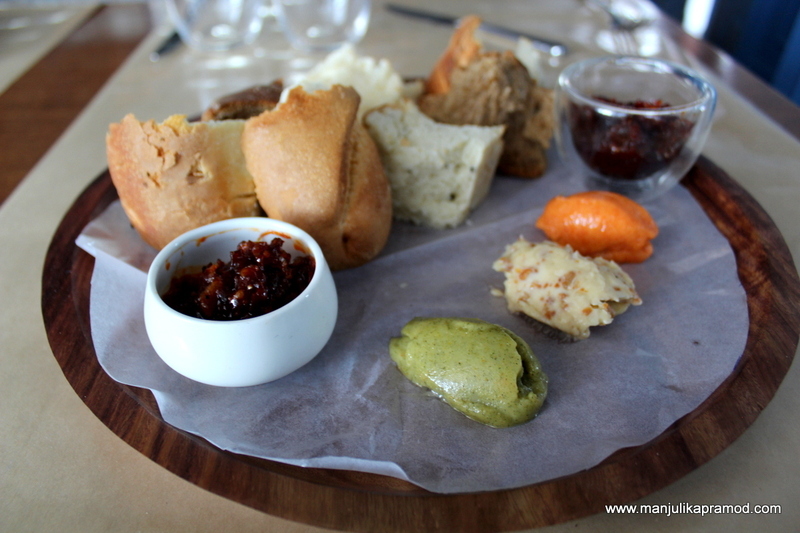 Bread basket with three different varieties of flavored butter. I liked the center one, garlic flavored. The breads were fresh and tasteful. Well begun is half done! 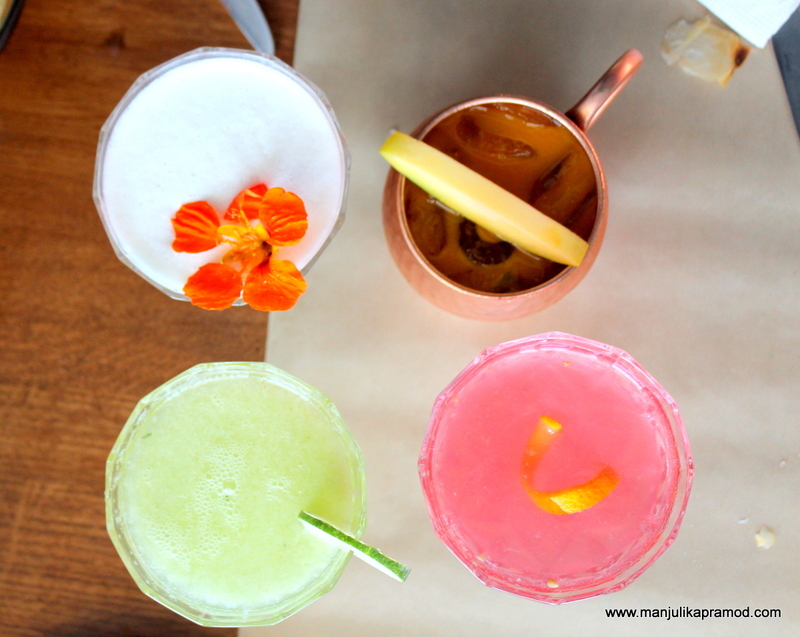 The first few dishes that came on my table and the four drinks that were served on my neighboring table appealed to my eyes first and impressed my taste buds later. The bread basket with flavored butters was served first. I quite liked the idea of having butter instead of cheese. The breads were fresh and yum. Well the green and orange colored butters were good, the garlic flavored one in the center overpowered the others with its strong garlic taste and I totally loved it. The chicken bakes was absolutely delightful. It tasted like mini patties with chicken fillings where the patty on the outside melted in the mouth to mix with the juicy flavor of the chicken. Trust me, I helped myself with the second bite on impulse. 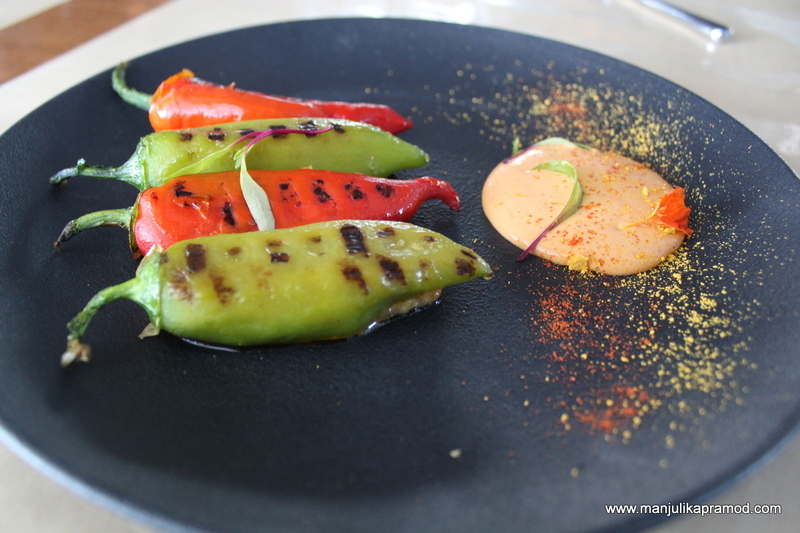 This chilly bell pepper has to be one of the most sought dishes for the vegetarians. This one will amuse you with its delightful preparation. I loved every detail about it. And such bright colors with edible flowers enhanced the whole experience. 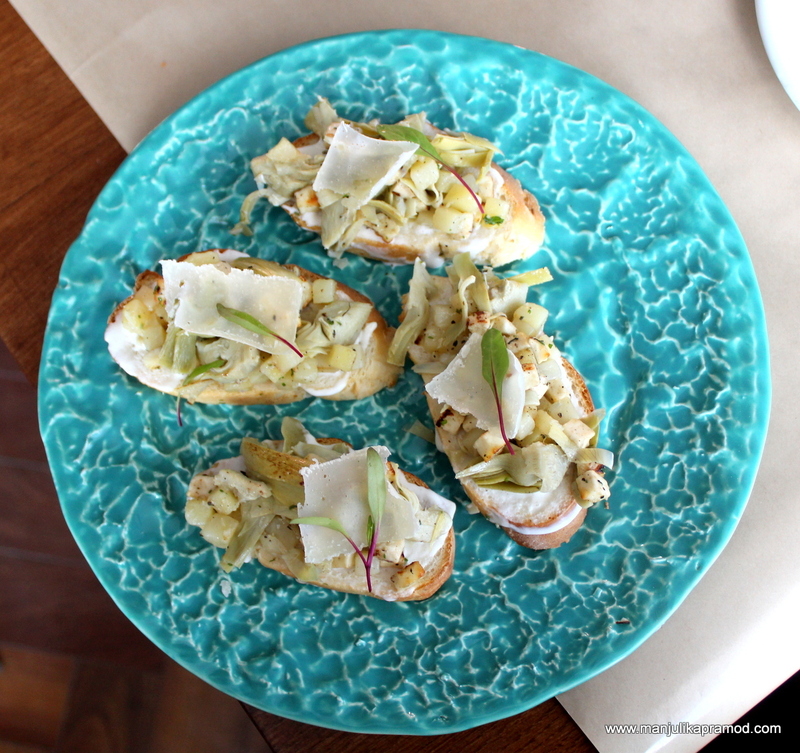 Artichoke & Potato Bruschetta was a favorite with potato lovers on my table. I will swear on the ricotta cheese salad. I relished everything about it. 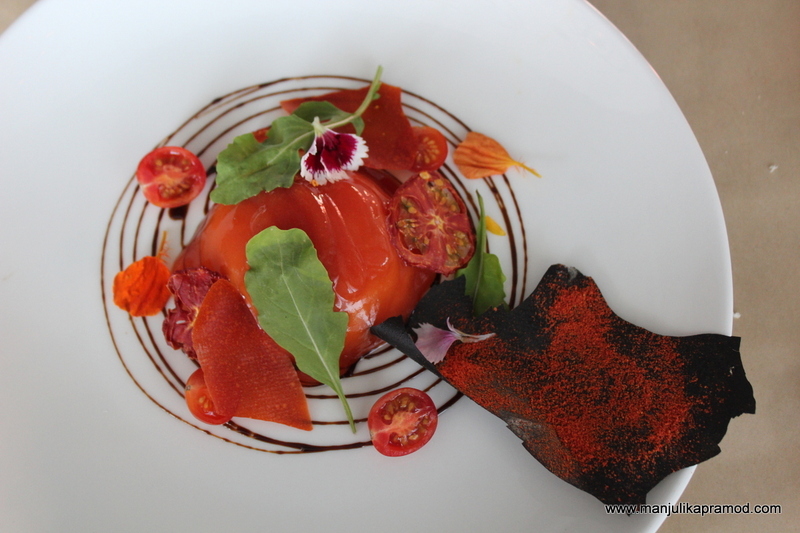 As the cheese melted and the unique combination of tomato melted in my mouth, it gave me immense respect for the chef. 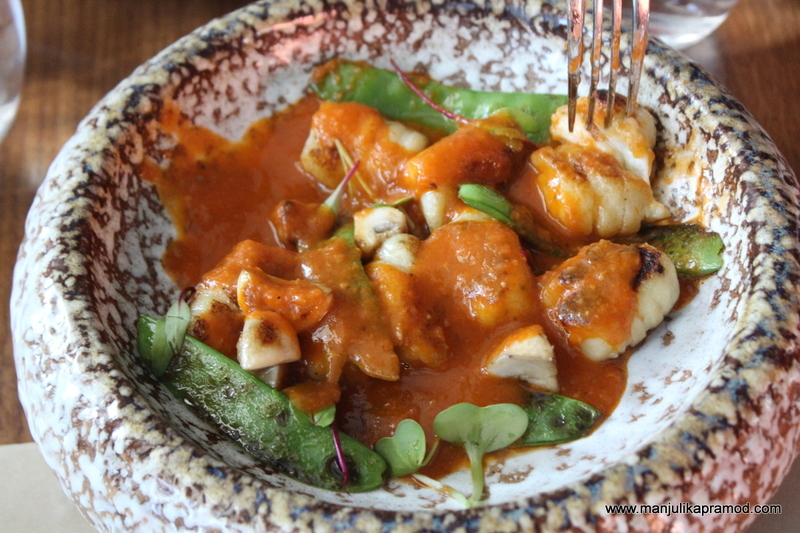 Gnocchi pasta with Napoli Sauce was absolutely well done. As far as I remember, after a long-long time, I had a good gnocchi pasta. For the uninitiated, I must tell you that gnocchi are small dumplings made from potato, semolina, flour, usually served with a sauce, made in Italian style. The chicken liver served with poached egg was a unique combination. At first, I was not very convinced about it. But when I actually digged into it, I couldn’t stop myself. The liver tasted amazing. These boats filled with lamb crumbles were amazing. The dip was fresh and perfectly made to blend in with the main dish. 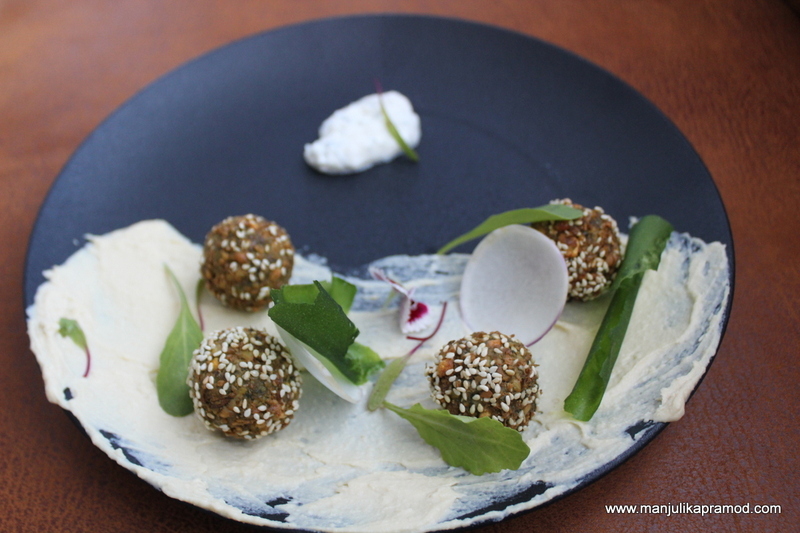 If you love falafels, you might want to check out some here too. It was crisp and meaty. 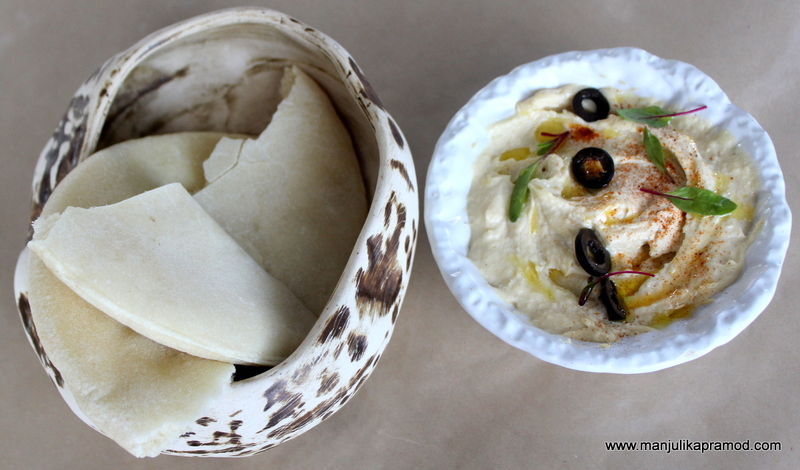 I really appreciated the way the hummus was spread on the platter. Of all these, my favorite was the hummus and pita bread. 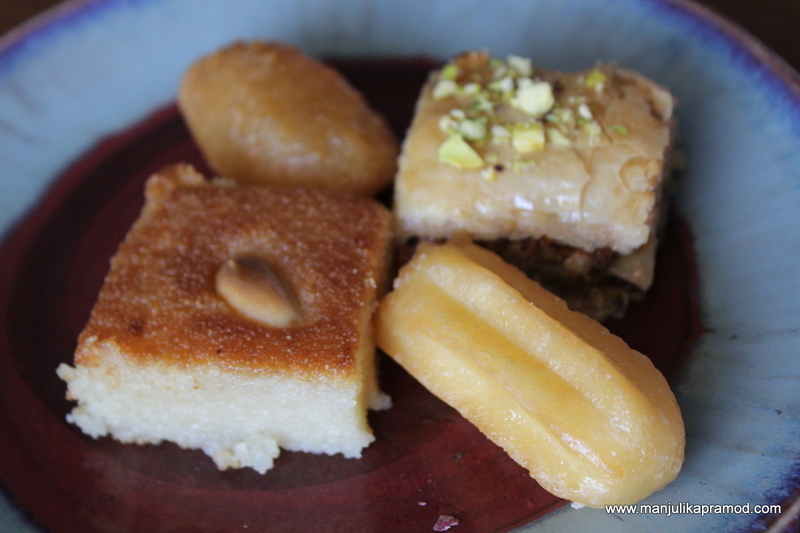 It reminded me of the good times and the good taste that I had picked from my travels in Middle East. 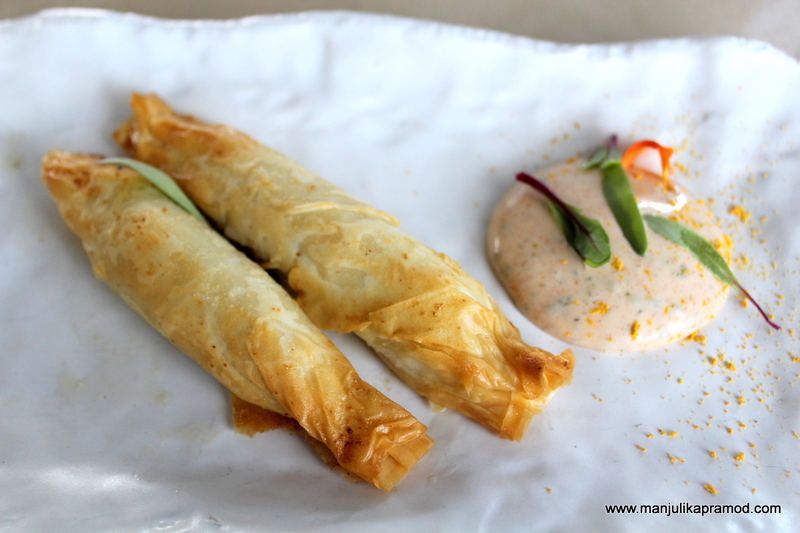 After indulging into every starter that came on my table, I went for small bites of three main course dishes. 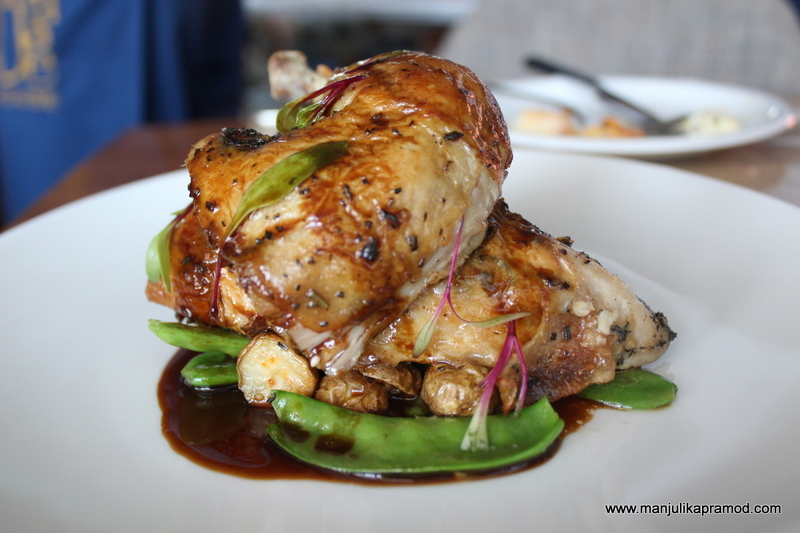 The roasted chicken was cooked to delight a foodie’s soul. 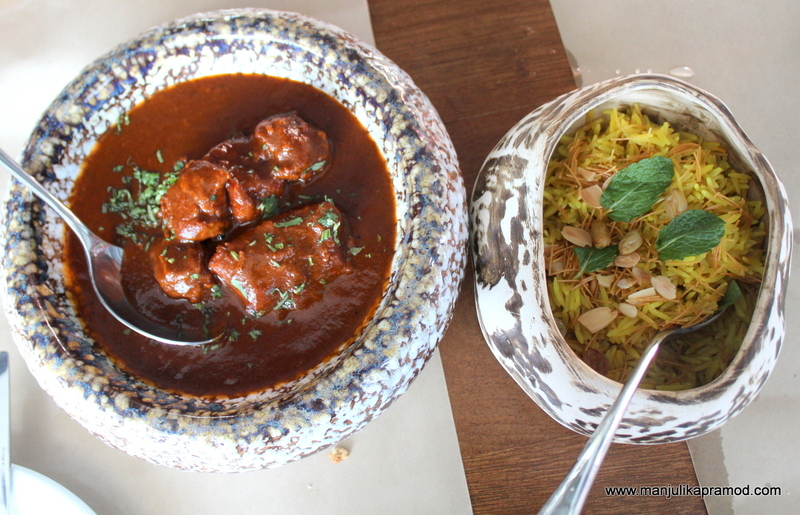 The mutton curry served with the pulao was cooked absolutely to my taste. I love the combination of mutton and rice and therefore this dish got all my attention. Third but not the least, the barley risotto was quite a winner. 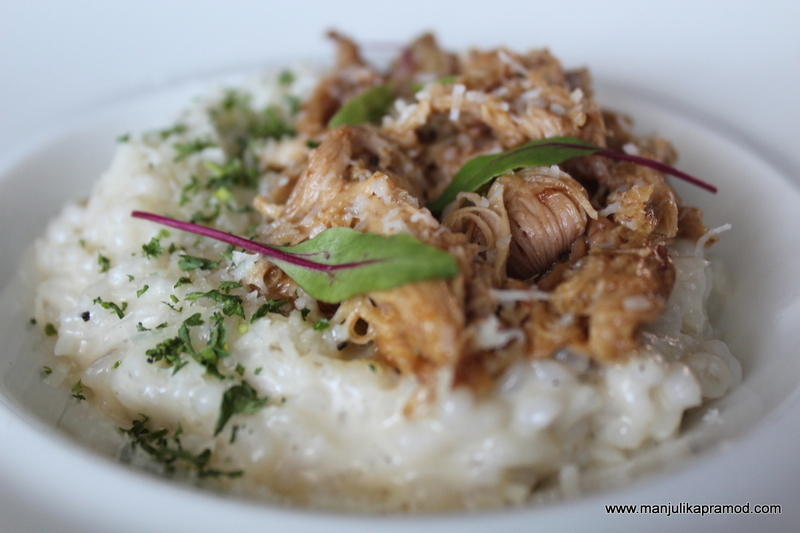 When there was lamb and chicken, I really dint want to get into risotto but I am glad I did. It was wickedly impressive. It had a a scrumptious blend of cheese, barley and spices. Caution, don’t ignore it on the menu too. You can’t miss the desserts! If you have a sweet tooth, you know what to do. Let the picture do the talking! 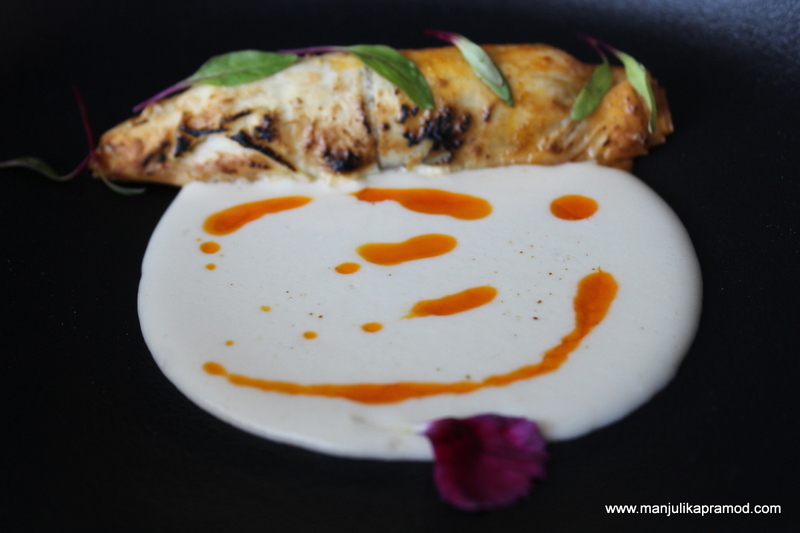 The blog would be incomplete if I did not talk about Chef Arvind Bharti. Having launched more than 11 restaurants in the country, he and his team create magic in the kitchen. Hailing from Dehradun, Uttarakhand, Chef Arvind comes with a hands-on experience of 7 years as a Head Chef in the restaurant industry. He is an alumnus of Institute of Hotel Management, Srinagar (J&K) and gets inspired by world-class renowned chefs like Chef Ferran Adria and Chef Thomas Keller. 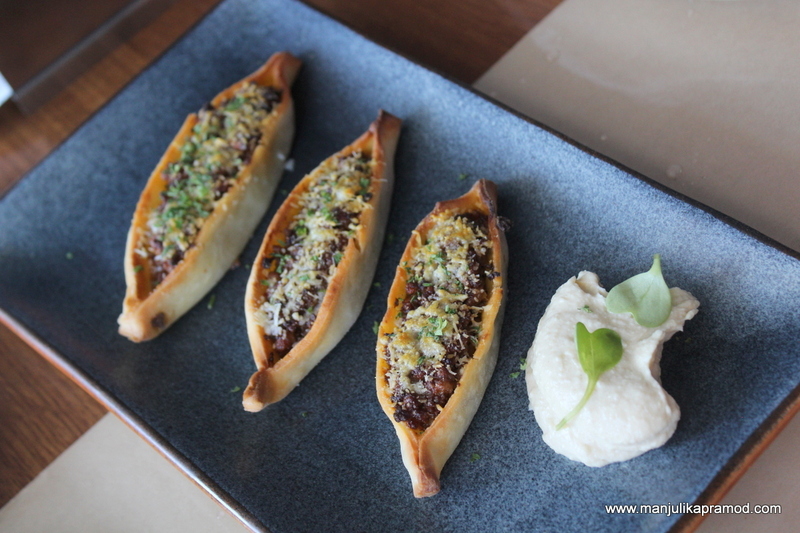 Overall : Amuse House is a must-must do! Trust me, you will want to go back, just the way I am craving to go back. Ansal Plaza is definitely picking up. I am sure the old times will be back. I have lived in Andrewsganj for a long time and have lot of memories about Ansal Plaza.